In the mid-1970s, the General Assembly of the United Presbyterian Church in the U.S.A. (UPCUSA) received a flurry of questions concerning homosexuality. Bill Silver , an openly gay Presbyterian, was a candidate for ordination in the Presbytery of New York , which had asked the General Assembly for “definitive guidance” on how to proceed. Around the same time, other presbyteries across the country sent in overtures that either reinforced the New York Presbytery’s call for definitive guidance or asked the assembly to reaffirm the presbytery’s own power to decide who to ordain. The General Assembly answered by forming a task force to study homosexuality, focused on whether to ordain practicing homosexuals. Nineteen members were appointed in September 1976 with Virginia West Davidson  serving as chairperson. For the next two years, the UPCUSA Task Force to Study Homosexuality met seven times to discuss their findings. The meetings included conversations about scientific and religious articles on homosexuality, often leading to lengthy debates as members clashed over biblical interpretations. The task force hoped not only to generate responses to their work, but to assist presbyteries in launching their own studies. 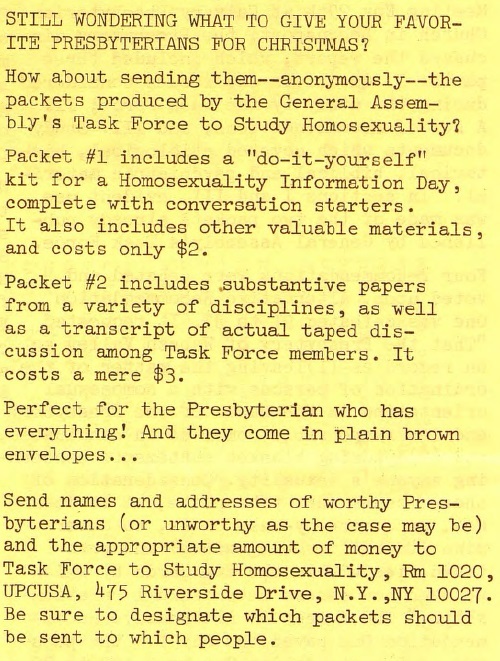 From April to June 1977, they released two study packets  that included copies of articles on homosexuality, testimonies they had received, and suggestions for how to host homosexuality information days. The study packets flew into presbyteries, with 5,000 copies purchased before December 1, 1977. The task force completed their study in January 1978, writing a final report  for the General Assembly that included a background paper, policy statement, recommendations, and a minority policy statement and recommendations. The majority statement advocated for the General Assembly to let presbyteries make their own decisions in all aspects of ordination. The minority statement, supported by five of the nineteen members, advised against allowing homosexuals to be ordained. The General Assembly voted in May 1978 to approve the minority statement. Although the General Assembly’s definitive guidance  reiterated the status quo regarding ordination, the task force initiated a conversation about the rights of LGBTQIA+ Presbyterians in a way that created hope that church members with very different opinions could find the grace to work alongside one another. The UPCUSA Task Force to Study Homosexuality Records  have been processed as a part of the Pam Byers Memorial Fund . To browse digitized material related to LGBTQIA+ history in the Presbyterian Church, visit our Pearl  online archives.